Is your school looking to refurnish classrooms? Golden State has the high-quality, cost-efficient school furniture that you are searching for. We carry school furniture for all room sizes and with a variety of capabilities. Our school desks have a variety of features; some come with keyboard trays, others with lifts lids, and some with chairs attached. 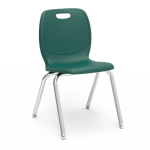 You can also browse our wide selection of school chairs to find comfortable and affordable chairs for your classrooms.